Heroes are a pretty recognizable lot. Cape, check. Mask, check. Flamboyant colors, check. Add in a few streetside escapades, the occasional spectacular array of super powers, and a handful of completely understandable collapsed buildings from the collateral damage and you have yourself a hero in the making! Of course, that standard equation doesn’t hold up for all heroes. There are… the others. The ‘heroes’ who are just looking for a fight! Anti-heroes. Black clad, shadow-dwelling, and oh the tortured pasts and the brooding present! They are willing to step up and perform the dark deeds where their golden age counterparts aren’t… beating the criminals into submission or even wielding the weapon of the villains, themselves. The appearance of the anti-hero changed the scope of heroics and opened up a whole new chapter. But, yet another would appear. What happens when the villain, whose dark heart and blind ambition is suddenly given just a hint of light? We can hardly call them heroes, but, dare we suggest the anti-villain? 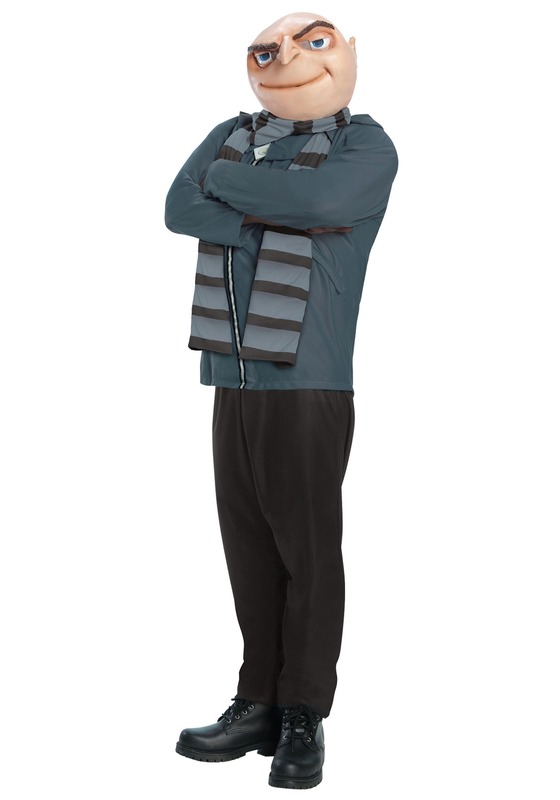 You can try your hand out on the lighter side of villainy with this Adult Gru costume. Become the most reluctant ‘hero’ imaginable with the black interlock pants with elastic waist and Gru’s iconic gray long-sleeved shirt with foam back collar. The image-making striped scarf is two-toned gray to hint at that shifting moral code and the molded latex mask shows Gru’s ever-present and winning smirk. All you’ll need next is a horde of willing minions to do your evil bidding so you can ultimately save the day!